The Multi Format 2014 replaces the MF1420. The MF2014 is the first case to be made with our new ShokBox construction. 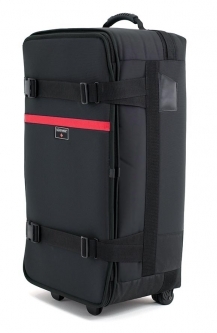 Essentially, it is made of compressed, structural foam covered with two types of padded fabric, so it is a veritable shock absorber, yet so strong you can stand on it or check as baggage. 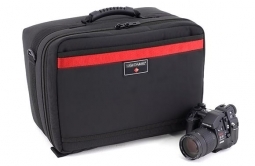 You will find this case to be ideal to carry a complete DSLR system along with speedlights and accessories, or a digital medium format system or even a 4x5 field camera with lenses, film holders, meter and accessories. It can handle small strobe systems like Dynalite MK8, Comet CBW, Lumedyne, or Profoto B2 along with a minimal camera set up. Perfect for two to three large monolights like Profoto B1, Elinchrom or Paul C. Buff. There are just a lot of possibilities. Equipment shown is not included with the case. 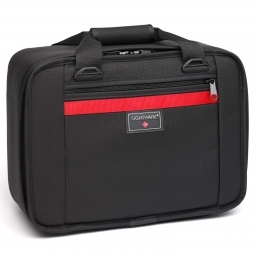 The divider system that comes with the case enables you to divide up your case to fit the likes of what you want to put in it. You cut the dividers to fit your equipment rather than trying to fit your equipment to a pre-arranged configuration. 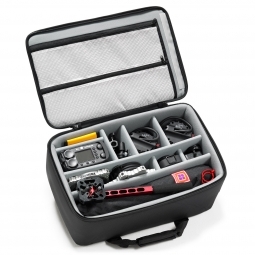 By virtue of making custom compartments, you are creating a very protective nest for each piece of equipment which greatly reduces or eliminates any damage to your equipment. Since the dividers are rigid, they also prevent your equipment from shifting around inside the case. Aside from the incredible protection you will get from this case,we have revamped the divider attachment system. Dividers now attach to the inside of the case and to each other by means of our new Sticky Pins. These are pins with hook material that fit into the ends of the dividers. Simply position your divider where you would like and the Sticky Pins will keep them in place.